The average American spends about 40 hours a week at work, but it can feel like an eternity if the office isn't a pleasant place to be. With next-generation startups offering pet-friendly workplaces and fridges stocked with coconut water, employees are more aware of office culture than ever before. But don't worry — you don't need an office foosball table to improve your work environment. Provide Regular Feedback - Ah, the annual review — these dreaded yearly check-ins are great for big picture talks, but most employees want to hear from their supervisors more regularly to make sure their performance is on track. Whether it's a quick coffee meeting or a chat at the conclusion of a big project, keep employees in the loop about what they're doing right and how they can improve. Have an Open-Door Policy - There's just something ominous about the boss marching a line of people into the office for a closed-door meeting in the middle of the day. Keeping the doors open whenever possible will keep office whispers at bay. Ask for Advice from Employees - The general working population likely has a keen sense of what can and can't be done on your budget or in your timeframe. Asking team members for their input will not only give you valuable intel, it'll also give them a sense of pride in their work. Switch up Meeting Locations - Bonus points for having it outdoors. Holding the same meeting in the same conference room day after day is not only a bore, it can be a colossal drain on creativity. Consider changing the scenery from time to time to inspire your team to think outside the box. Encourage Employees to be Ladies (and Gentlemen) who Lunch - If your employees are notorious for scarfing down microwaved meals in front of their computer screens, remind them that getting away from their desks for a few minutes will do wonders for their sanity. Suggest restaurants (or picnic spots for sack lunch-bringers) outside the building to allow maximum fresh air intake and a chance to reboot. 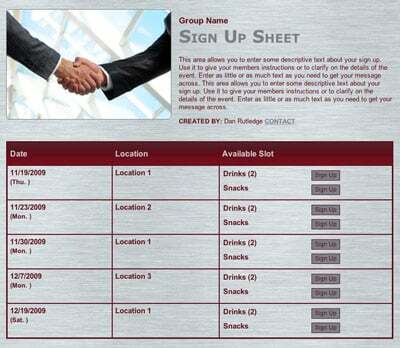 Plan office events with an online sign up! SAMPLE. 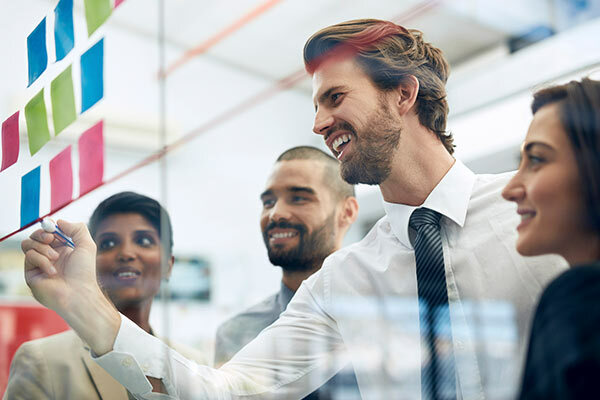 Acknowledge Success - The two-second investment of saying "Great job on that project" will pay huge dividends with employees who want to feel appreciated. Even if you aren't in a management position, you can still congratulate colleagues for doing something well — extra credit for pointing out specifics and why they were great. Learn from Failures - You can't win 'em all. Don't waste energy playing the blame game or unloading angry speeches when something goes wrong. Instead, talk about how those mistakes can be avoided next time. And don't forget to talk about what went right. Offer Flexible Scheduling - Do you really need all employees to be at their desks from 8 a.m. to 5 p.m. every day? Allowing for a flexible schedules will not only improve their work/life balance (always a plus) but also show you trust them to get their jobs done. Give Back to the Community - Hosting a blood drive or volunteering at the humane society will not only show the community you care — they're also great team-building exercises. Don't Put Anyone in a "Box” - Sure, you may have hired someone to be an administrator, but don't assume he'll be managing the switchboard forever. Watch your employees' talents and be willing to move them around, even among departments, if it seems like a better fit. Give Employees a Clear Path to Career Goals - Employees who feel stuck in their position will eventually stop caring, which can bring the whole team down. Meet with staff members regularly and ask them their plans for the future within your company, then explain how they can get there. Recruit/Train for the Future - Even if you're fully staffed, start thinking ahead about how you'd pick up the slack if someone leaves. Hire people with multiple skill sets and train lower level employees in some of the duties in higher-up positions so you have multiple people ready to step in if necessary. When there's turnover, morale won't take as much of a hit if your staff knows the office will be able to handle it. Invest in Continuing Education - Is one of your employees a great candidate for manager, except for his crippling fear of public speaking? Consider sending him to a course at the community college or a nonprofit business entity. If you have the capital, paying (even partially) for higher education is a great way to retain top talent and mold them into your company's future leaders. Schedule a Lunch and Learn session with an online sign up! SAMPLE. Offer Regular Raises (or Get Creative) - If it's not possible to compensate the way your employees want, come up with some alternative benefit options. Can you offer a flexible healthcare spending account? Reimbursement for childcare? Paid birthdays and holidays? Showing employees you're willing to try other avenues will placate them until the cash is flowing again. Stock the Fridge - Coffee and snacks aren't that expensive in the long run, and they give employees one more thing to look forward to at work. Host After-Hours Events - Take the crew to a baseball game, a brewery opening or any other event to boost camaraderie in the office. Employees who are comfortable with each other socially will be better at collaborating in a professional setting. Get Healthy - Workplace health initiatives can improve morale and foster an atmosphere of teamwork. Set some office-wide goals (100 total miles walked or 100 gallons of water drank by month's end, etc.) and make it a fun competition to achieve them. Added bonus: Healthy employees miss fewer days of work for illness. 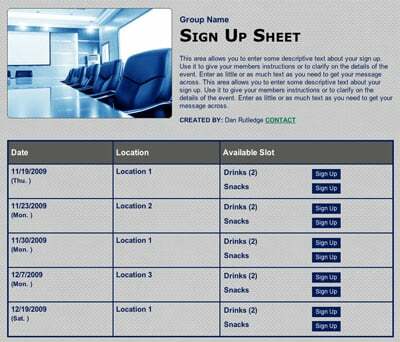 Plan a team-building trip with an online sign up! SAMPLE. Don't be Afraid to Teach an Old Dog New Tricks - If you're in an old-school office and know you need a corporate culture overhaul, you're already halfway to solving the problem. But don't be intimidated — you don't have to switch to a startup atmosphere overnight. Make a list of attributes you'd like to improve, and figure out how to get on the right track. Ask the Masses - Your employees probably have strong opinions about what would improve their daily experience at work. Invite them to share their ideas with you — anonymously if they prefer. Bring in a Pro - If you have the budget, consider bringing in a consultant who specializes in office culture. These people have likely seen dozens of offices in a variety of industries, so they'll be able to come up with ideas you've never even thought of. Creating a positive corporate culture is a worthy goal and one that will pay handsome dividends for your company. Ultimately, you’ll make employees happier — and improve the bottom line. Plan a business development seminar with an online sign up.